If you lift weights there’s a good chance you consume protein shakes, and when someone says “protein shake,” they pretty much always mean whey protein shake. It’s cheap, it’s tasty, and it’s far and away the most popular protein shake on the market. Then there’s the dark horse of the protein powders: casein. Like whey it comes from milk, but it’s a little pricier and far less popular. But funnily enough, there’s an argument to be made — a controversial one — that casein could potentially be better for strength and muscle gain. So why isn’t it the go-to post-workout? Today we’re doing to dive deep into the benefits of casein and whey for strength, health, and muscle gain, but let’s start off with the obvious question. What the heck is this stuff? Cow milk is widely considered a decent source of protein (about 10 grams in a glass) but it actually contains two kinds of protein: 20 percent of it is whey and 80 percent of it is casein. So how does it get from udder to protein tub? Long story short they’re usually products of cheese making. Milk is separated into curds and whey with heat, acid, or enzymes, and the curds — which are high in casein — can be used to make cheese. This is why whey is sometimes considered a waste byproduct, which is why it tends to be a little cheaper than casein. Its most basic form is whey concentrate, which has the most carbs and fat. You can process that into the pricier and almost carb- and fat-free whey isolate, or you can process it even more and make it even more expensive with hydrolyzed whey, which could be considered partially digested or broken down, so it digests a little faster. You can take the curds and use them to make cheese or you can process them into powder and generally speaking, the most sought after form of casein is micellar casein. That’s when the protein is encased in an intact micelle, a sort of globular structure, and when that micelle is intact casein appears to be a bit more bioactive and, most importantly, it forms clumps. So what does that mean for strength and muscle gain? You might think that since whey digests faster, it’s better for gaining muscle when the body needs protein, say, after a workout. Or you might feel that casein is better for gaining muscle because the fact that it digests more slowly means that amino acids are released over a longer period of time, and it can therefore do a better job of helping you build muscle throughout the day. People are split on this issue. The advice you typically hear, based on the digestion rates, is to take whey post-workout, take casein before bed, and take a blend of the two any other time. Is Casein Better Than Whey? The research looked at 38 police officers on low calorie diets, divided them into groups taking hydrolyzed whey and hydrolyzed casein (along with a control group) and found that after 12 weeks the guys taking casein had lost 50 percent more fat and increased their performance on the bench, strict press and leg extension by about 30 percent more than the whey group. Sounds very exciting, right? It does, but not to a lot of scientists. “The reality is the placebo effect is massive and the way that I give you a supplement as a researcher will dictate your performance. If they wanted casein to work better, it will work better. There’s no way to effectively blind the study, and if it did actually work (better) it would have taken over the market place by now. No one’s saying there’s no difference between the two proteins and it does appear to be true that consuming casein results in more long term release of amino acids into the bloodstream. But when you’re looking at two proteins, particularly two complete proteins, the difference between the two as far as strength and body composition goes will really depend on who trains harder. So let’s put strength and muscle to the side — what about the health effects? So if everything else is the same is it a better idea to consume whey concentrate? It’s important to note that there’s a lot of research done on fresh whey from fresh milk, but very little research explicitly done on the highly processed and sweetened and powdered whey that you might have bought today but has been sitting on a shelf in your supplement store or a warehouse for months. That’s a fair assessment. We do need to emphasize that it’s not quite so much that we have lots of data showing there are next to no immunoglobulins in the whey in your local supplement store, it’s more that we don’t have lots of research showing they are there, and that we use them, and that if we use them, they improves our immunity. So What’s the Most Important Practical Difference Between Whey and Casein? 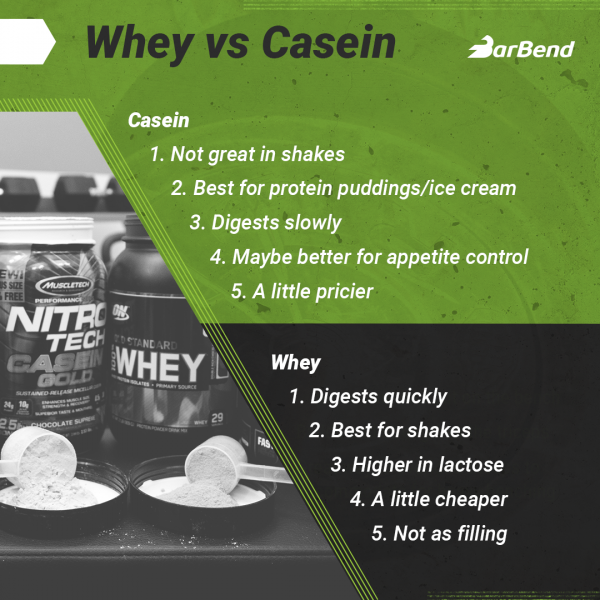 Casein is a tiny bit more expensive — usually like 1 or 2 more cents per gram of protein — it’s a bit more filling, and it’s because it forms paste pretty quickly it’s worse in shakes but great for puddings. (Pro tip: freeze the pudding for an hour or two and you’ve got protein ice cream.) Casein may be a better bet if you’re having a long gap between meals, but practically speaking it’s unlikely this will make or break your physique. Either protein is great for an athlete, but above all it really depends on how much time you want to spend consuming it and how much you want it to reduce your appetite. Boirie Y, et al. Slow and fast dietary proteins differently modulate postprandial protein accretion. Proc Natl Acad Sci U S A. 1997 Dec 23;94(26):14930-5. Hoffman JR, et al. Protein – Which is Best? Sports Sci Med. 2004 Sep 1;3(3):118-30. Demling, RH, et al. Increased protein intake during the recovery phase after severe burns increases body weight and muscle function. J. Burn Care Rehab, 1998;19:161-168. Demling, RH, et al. Effect of a hypocaloric diet, increased protein intake and resistance training on lean mass gains and fat mass loss in overweight police officers. Ann Nutr Metab. 2000;44(1): 21-9. Messina M, Lynch H, et al. “No Difference Between the Effects of Supplementing With Soy Protein Versus Animal Protein on Gains in Muscle Mass and Strength in Response to Resistance Exercise.” Int J Sport Nutr Exerc Metab. 2018 May 3:1-36. Wilborn CD, Taylor LW, et al. The Effects of Pre- and Post-Exercise Whey vs. Casein Protein Consumption on Body Composition and Performance Measures in Collegiate Female Athletes. J Sports Sci Med. 2013 Mar 1;12(1):74-9. Fabre M, Hausswirth C, et al. Effects of Postexercise Protein Intake on Muscle Mass and Strength During Resistance Training: Is There an Optimal Ratio Between Fast and Slow Proteins? Int J Sport Nutr Exerc Metab. 2017 Oct;27(5):448-457. Bell, SJ. Whey protein concentrates with and without immunoglobulins: a review. J Med Food. 2000 Spring;3(1):1-13.